What should I put up as decorations? 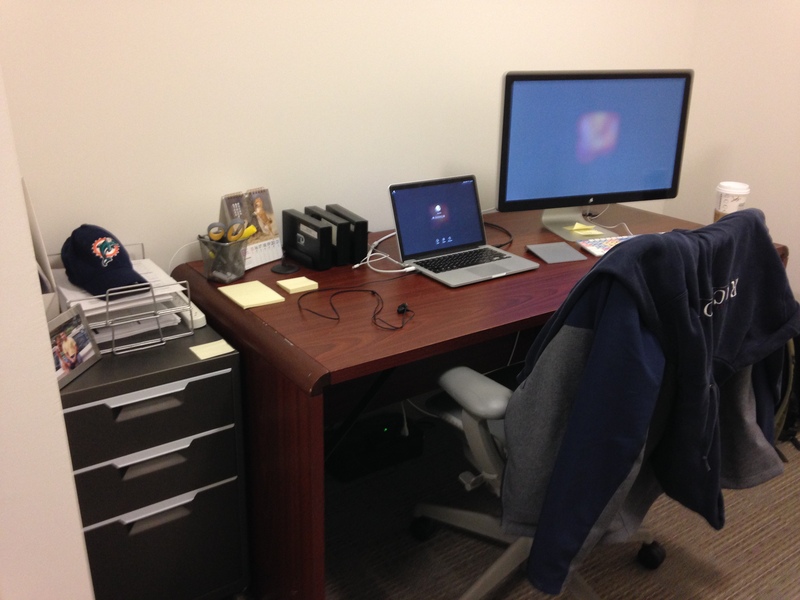 #1 – I finally moved into my new edit bay at the office! Here’s a picture of phase 1. Next up is phase 2, which is all about decorations. Any ideas on what I should put up? 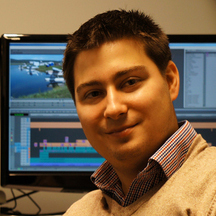 #2 – I got featured on Pro Video Coalition! How crazy is that?! Scott Simmons is doing a post production quick tip everyday this month and he offered to let me write one. Read it here! Have you ever felt like there is so much you have to do but then instead of doing one of them you decide to sit down and start watching TV? That’s where I’ve been for the past couple weeks. There is sooooo much going on and I haven’t gotten anything done because I don’t know where to begin. 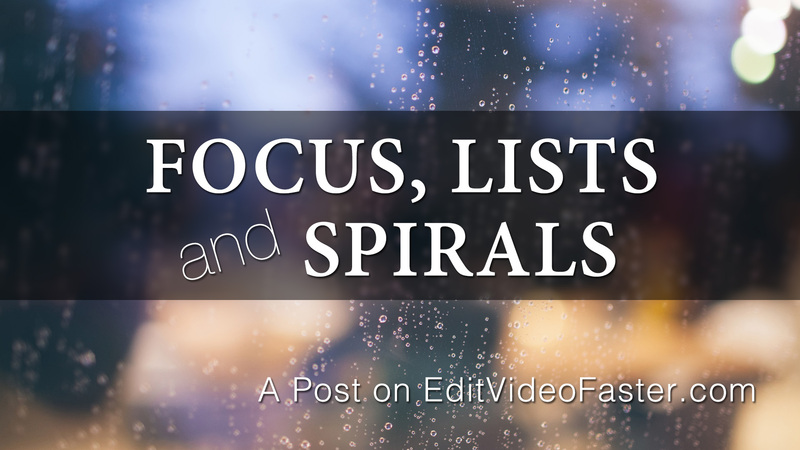 I really want to get back on track, if I was ever actually on track, with writing more how-to or instructional posts about editing. However since this feeling is so over-whelming at the moment I feel like I should share this struggle with you, tell you what I’m doing about it and get your thoughts on the topic. Just. Focus. On. A. Couple. Things. I’m a huge believer of setting a couple most important tasks (MITs) for the day then knocking at least one out as early as you can. By most important tasks I don’t mean a giant list of 25 to-dos. MITs are the 2-3 things that will have the greatest impact on your life. Today I have three. That’s it. If I get these three tasks done today I’ll be able to go to sleep easy tonight. If I don’t, then I’m sure I’ll lay there thinking about what I didn’t get done. That’s also why I don’t make the list like 20 items long. I’d never get them all done! And then at the end of the day I’ll be lying there thinking about the other 17 things I didn’t get done believing I got nothing done with my day. Every few months I have to change where I write down my MITs. I used to use an app called Any.Do. That worked for months but I eventually started to ignore it. I would never check it throughout the day to make sure I’m staying on track and I began to completely ignore the reminders I’d set for myself. After Any.Do I started using Reminders on my iPhone. That worked really well until I started adding in all my other tasks in there. I had a separate list for my most important tasks but it just looked like another reminder when I’d get the alert so I started to ignore it. I still use Reminders to remind me to change the air filter, buy milk and all those other non-super important things. Then I started jotting them down in Notes, also on my phone. This has been working really well until around the beginning of February. I realized I would jot the same stuff down nearly everyday… “Workout, Create Tutorial, Edit New Lesson.” I’d switch tutorial for post or something else. And it just became something I did in the morning, not a list of important tasks I was trying to accomplish today. I’m done jotting my most important tasks down into Notes or on my phone in general. I feel like I need to physically write them down something specific in a planner (or on a notecard) and take it with me everywhere I go. I have this little daily planner I bought at the ¥100 Shop (think awesome, Japanese version of the Dollar Store) when I was in Japan a few months ago. 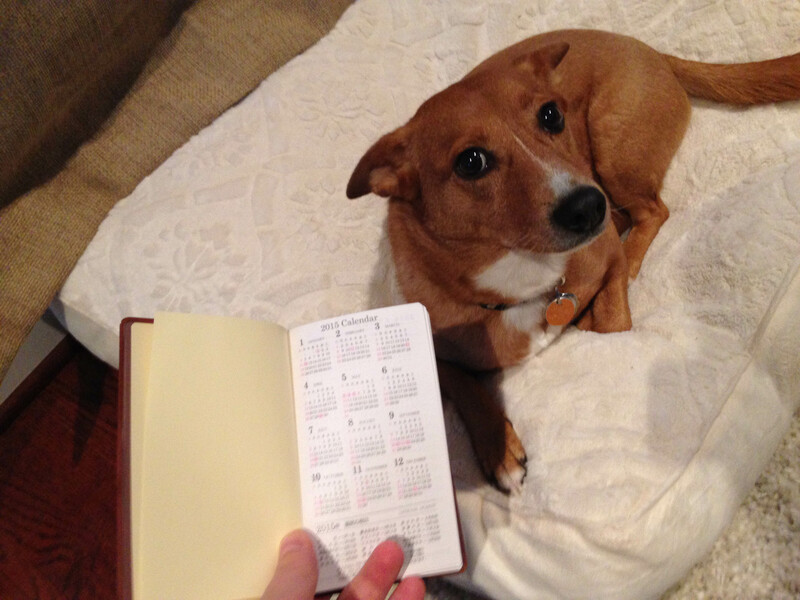 My day planner. And Peyton. Okay, I know you’re only looking at this picture because of her. I already know that in a few months I’ll start ignoring the planner but I need something to work now. When it happens, I’ll find something else that works. Maybe you can leave a comment below telling me what works for you? When you have sooo much on your plate you can get into an uncontrolled downward spiral. For me when I have a ton of things I gotta get done all I want to do is watch TV, play a game on my phone or surf Twitter. Or, almost as bad, I start doing the little things around the house. I feel productive because I did a load of laundry however this did absolutely nothing towards reaching my ultimate goals. How will I ever make an income from this site if I’m organizing my closet instead of building cool products? When I slack on doing what I need to get done, the amount of what I have to get done just keeps piling higher and higher on top of itself and I end up having to do it in way less time, if I get to it at all. I feel myself falling into one of those spirals right now. My birthday was over the weekend (yes, I’d love for you to wish me happy birthday in the comments) and I had a blast. My wife is awesome and planned amazing things for me to do all week. However it completely consumed all the time I usually spend on this site and other projects. It really got me out of the rhythm that I’ve built up slowly over the past 8 or so months. I missed finishing my tutorial last Friday! I’m so angry with myself for that. It’s 100% my fault. I ran out of time. I could have spent 15 minutes here or there throughout the week working towards finishing it. I kept telling myself I needed three hours of undisturbed time, which wasn’t going to happen. Friday morning came and I tried to rush through it but ultimately I didn’t get a chance to before I was whisked away on a birthday adventure. What I could have done is use 15 minutes here or there throughout the week to work on it. I love sitting down and working on huge chunks of projects at a time. I feel so accomplished when I’m done. I can really get into the flow of it all too. With 15-minute chunks, you can’t really get into it. But you can get small parts done. I could have easily written the copy for YouTube and this site. I could have made the thumbnail. There are a handful of other things too that I didn’t need to have hours of focus for that I didn’t take advantage of. Stopping these downward spirals is crucial to succeeding in whatever it is you want to do. I’m working on regaining control of mine and aiming myself in the right direction for success. That’s why I wrote this post…to realign myself, learn from my mistakes and keep moving forward. I am off to the gym now that I got my most important task knocked off! Time to cross off another one. Then another. Then repeat tomorrow. When was the last time you have so much to do that you decided to just not do anything? How did it turn out for you? What did you do to get yourself turned back in the right direction? I want to know. Leave me your thoughts in the comments or private message me here. Can you do me a favor? If you enjoyed this post and think another video editor or creative professional would enjoy it too, please send it over to him or her. Thank you as always for reading, commenting and sharing. I’ll see you on Friday with a new tutorial! I promise! I’m writing it down in my planner.